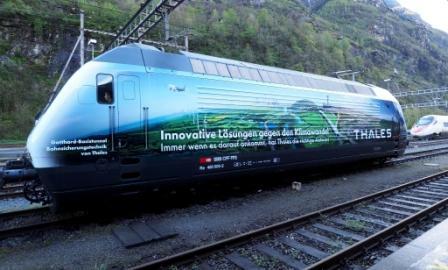 Thales has integrated its cutting-edge train control system, ETCS Level 2, into the new Gotthard Tunnel connecting the Swiss-Italian and Swiss-German regions under the Alps. “Thales’s advanced ETCS signalling technology will allow for the circulation of more than 300 trains per day at speeds of up to 250km/h in both directions,” the company said in a media statement. Thales said its involvement in the Gotthard project spans managing the development, production, installation, integration and homologation of the rail signalling systems within the overall system. “These systems have been built up under realistic conditions in the company’s Gotthard laboratory in Zurich and are the result of 8 years of work by a German-Italian bilingual team!” reads the statement. The Gotthard Tunnel will stretch over 57 km at a depth of 2.300 meters under the Alps, cutting travel times from Zurich to Milan to under 3 hours (an hour less than today). Now officially the world’s longest railway tunnel, it is expected to significantly reduce CO2 emissions, as it will shift transportation from road to rail. “We are very proud to contribute to this exceptional project, which was the most important missing link of the European corridors, connecting Rotterdam to Genoa,” said Peter Huber, General Project Manager Transtec Gotthard.